The author of the Commissario Guido Brunetti series presents more than fifty humorous, passionate, and insightful essays about her life in Venice that also explore her family history, her former life in New Jersey, and the idea of the Italian man. What a delightful, sometimes dark group of essays! Witty, sometimes hilarious, often self deprecating, always with an brilliant edge. Nothing is off the table. The conversation cuts a wide swathe through life in all it's complexities. 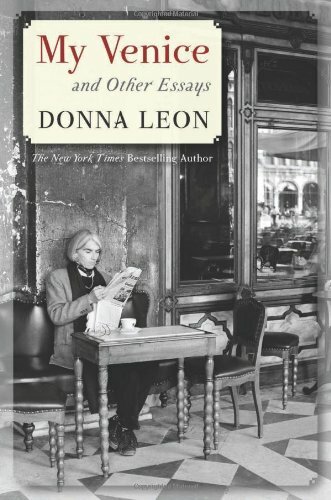 Donna Leon brings Venice alive. Through the eyes of both an inhabitant and an expat we taste the puzzling differences and laugh at the idiosyncrasies, and the similarities. Each essay is a little gem and tells us something about Italians and Venice that as tourists we would never discover for ourselves. I must admit there are some moments when I felt positively guilty about being a tourist in Venice. But Venice is only the beginning. Leon pulls no punches when she talks about male female relationships in Italy. Her dismay about attitudes is palpable. We journey to the United States and New Jersey with equal vigour. Certainly the streets and the people spring to life in all places. Life viewed through Donna Leon's eyes is certainly a grand experience. The backstory: Venice is one of my favorite cities in the world. I first visited it in the summer of 2004, on my way to Athens, Greece for the Olympics. I fell in love. Two years later, Mr. Nomadreader and I opted to spend our Christmas and New Year together in Venice rather than decide whose family to visit. Despite my love of both Venice and mysteries, I still haven't read Donna Leon's much-acclaimed series set there. It's near the top of my list, but in the meantime, I had to read her essays about Venice as soon as I got my hands on a copy. The basics: My Venice and Other Essays is a collection of essays and vignettes divided into these sections: On Venice, On Music, On Mankind and Animals, On Men, On America, and On Books. My thoughts: I've often bemoaned how difficult it is to review a collection of short stories, and here I find myself with the same problem as I attempt to cohesively talk about a collection of essays that itself is not terribly cohesive. As I finished the first essay in the collection, I said "that's it?" Truthfully, I wouldn't consider any of the essays about Venice to be essays. While classically there may not be a prescribed number of pages an essay must be, I found these pieces to also be lacking the things I most love about essays: immersion, reflection, and wisdom. The pieces themselves aren't necessarily bad, but when I expected essays about Venice, they didn't meet my expectations. If, however, you go in expecting brief, curmudgeonly anecdotes about life in Venice, you will find them. Early in this collection, Leon comes off as quite an unhappy person. She frequently shares her annoyances and they often read more life rants than observations. Once the collection shifted away from Venice, however, moments of wisdom, clarity, and joy began to emerge. I was surprised how much I enjoyed her musings on animals, as I am far from an animal lover. Leon was at her absolute best when offering insight on American and books. Perhaps her musings on Venice would delight Venetians, but they left me cold. When she turned her critical expatriate eye to the United States, however, I was enchanted. It is apparent at least some of these essays were written, if not also published, some time ago. There are numerous references to current events that aren't current. There are references to U.S. presidents I don't think are the current one. As a reader, I would have found it helpful to have a date written or previous publication information shared to help illuminate the setting and perspective Leon brings. Favorite passage: "In an age where meaning has been tossed out in favor of rhetoric, in a time when films are mere concatenations of loud noises and the shedding of human blood, it is to be expected that language should no longer be considered the chief means by which we reveal ourselves, our thoughts, and our feelings. When meaning disappears so, too, must the ability to perceive it."